Beyonce and Jay Z‘s latest HBO special aired on September 20, just a week after it was taped during their final joint tour dates in Paris. By now, the public already knows what to expect of Beyonce and Jay Z On the Run: How Beyonce essentially brought a routine that she perfected during her preceding Mrs.Carter Show World Tour, only now with her husband as the world’s most expensive hype man. How tweaked versions of lyrics addressed and sparked rumors of infidelity and pregnancy. How this tour’s premise was of these two stars imagining themselves as American outlaws – a blockbuster event more anticipated than any million-dollar film adaptation that Hollywood offered this summer. But the larger point of watching On the Run isn’t to reckon with a new plot twist. It’s to be dazzled by how expertly produced it all is: Their gritty fantasy played out on the venue’s large screens. That barre routine during “Naughty Girl.” Words from author Chimamanda Ngozi Adichie‘s TED speech, flashing on the screen to cheers. Onikuhhhhhhhhhh. When Jay Z wraps his arms around Beyonce, right when she sings “Surfing all on this good good.” The hazier footage of the couple vacationing on yachts, then playing with Blue Ivy Carter — Beyonce’s expertly curated Tumblr come to life. 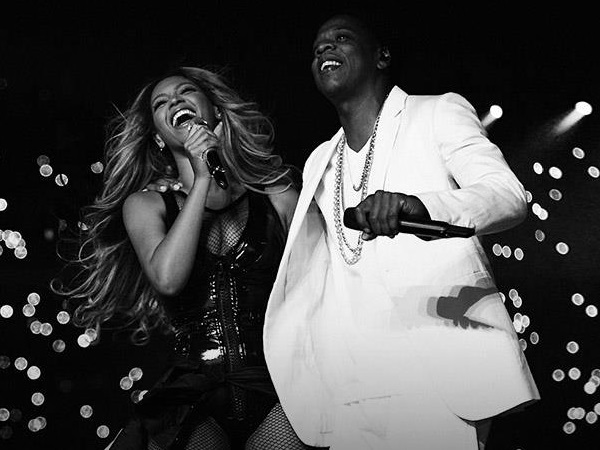 Watch highlights from Beyonce and Jay Z On the Run below.